A guerrilla artist puts up her own wall labels at the Met to expose male artists’ bad behavior. 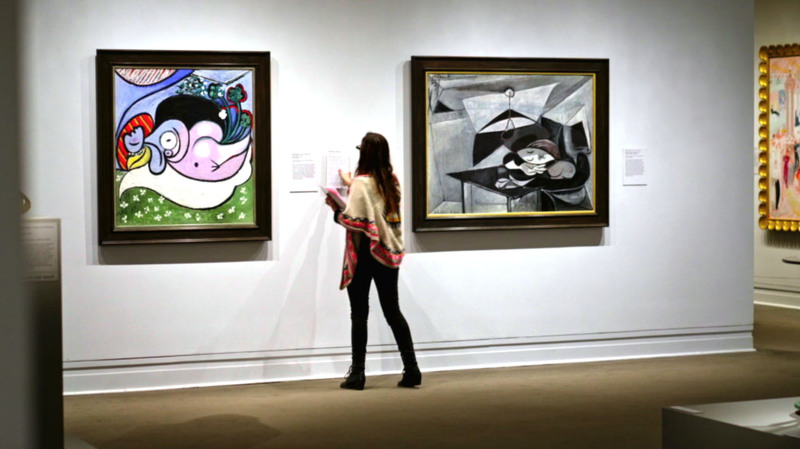 Do museum wall labels hide artists’ misogyny? Gauguin and Picasso protested at Met. You may think you know Warhol, but his Whitney retrospective holds many surprises. There has been no greater artist since Andy Warhol than Andy Warhol. Everything is Connected: Art and conspiracy at the Met Breuer. The 10 best booths at Art021 Shanghai art fair. Art021 wants to mint a million new Chinese collectors. Expanded West Bund Art Fair builds market momentum in Shanghai. Here’s the Artist List for the 2018 Shanghai Biennale. Can Banksy’s market go global? With a dedicated selling show in Hong Kong, Phillips is betting on it. Banksy hands out 1000 free posters at London travel market. Nicole Eisenman makes a dramatic turn to sculpture in her first solo institutional show in Germany. Ellie Wang’s explosive paintings reimagine commonplace objects. David Kordansky Gallery now represents Huma Bhabha and Lauren Halsey. David Zwirner Now Represents Njideka Akunyili Crosby. New MOCA director Klaus Biesenbach embarks on a ‘civic-minded’ mission to steady the museum. Did you know Ellsworth Kelly and Alexander Calder were pals? They even exchanged art gifts. Louvre Abu Dhabi tops one million visitors in its first year. The elusive Water McBeer shows his coveted collection at Jeffrey Deitch. David Salle touches god in seldom-seen paintings going to the Parrish Art Museum. Houston museum reattributes painting to Velázquez. Take a 100-year trip through art history with Claude Monet’s monumental water lily painting. The tenderness of Paul Anthony Harford’s drawings. Julian Schnabel is the latest celebrity to guest curate a major museum show, a trend that is here to stay. What to watch on the block during New York’s fall auction sales. Why Edward Hopper’s “Chop Suey” could break the $100 million mark. In rare moment of market transparency, valuable Hockney pool painting to be sold without reserve. Jeff Koons found guilty in plagiarism dispute with Naf-Naf and ordered to pay $168,000. Collector who sold a fake old master through Sotheby’s must repay the auction house $1.2 million. Robert Indiana’s estate is auctioning $4 million in art to cover mounting legal fees. New copyright regulations could prevent artists from sharing work on social media. Barbara Kruger revisits a 40-year-old series that’s as relevant as ever. David Zwirner is number one on the 17th edition of ArtReview’s Power 100 list. The Pérez Art Museum Miami is launching a new fund dedicated to Latinx and Latin American Art. Catherine Opie’s new show is literally about burning down the establishment. Washington, DC grant-making commission issues morality clause, then quickly backtracks. Kerry James Marshall is done with public art after Chicago attempted to sell his mural. This painting of Jesse Jackson as a white man provoked a sledgehammer attack. The magic of Peter Halley’s paintings won’t show up on your iPhone. Björk’s movie debut, The Juniper Tree, is restored and revisited. What is the secret to making it as an artist? A new study says the first few years are key. What it means to dream Avant-Garde.